The Volcanic Hazards Simulation is a complex role-play, where students and instructors play volcanologists and emergency managers during a simulated volcanic crisis in one of two authentic scenarios based in New Zealand: the Tongariro Volcanic Complex (Regional impact from a range of explosive eruptions), and the Auckland Volcanic Field (Localized impacts from submarine-subaerial monogenetic eruptions). The core activity is a 4-6 hour face-to-face workshop, where students manage and mitigate volcanic activity, and work together to communicate the scenario to the public and specific stakeholders. It is best suited to a medium-sized (12-40) upper division undergraduate or postgraduate course with support from several facilitators (instructors and research staff in volcanology, emergency management, and natural hazards). The activity is supported by pre-readings, pre-lectures, and pre-activities which are designed to prepare students for the scientific, emergency management, and science communication tasks which are played out in the scenario. Assessment for the module is typically done through preparation group and individual activities (i.e., critiquing of media releases, presentation of a volcanic hazards map) and on-the-day peer- and self-evaluation of performance (via rubrics) during the simulation. A detailed instructor manual is provided (below) which walks the staff through the entire process of organizing and implementing the role-play. Students must work together to mitigate the impacts from the volcanic eruptions. Observe volcanic monitoring data and social media in "real-time"; record observations and communicate these observations to a team (orally and in writing). Collaborate within a team, by using multiple streams of data in "real-time" to develop a working-model (inclusive of scientific and social-economic data) together in order to: a.) assess the current state of volcanic activity; b.) identify major changes in volcanic activity; c.) judge if changing conditions threaten the human population; d.) use a-c to assign appropriate volcanic alert levels; e.) respond to community concerns. Estimate and illustrate the distribution of volcanic products (e.g., volcanic ash) based on the volume and style of activity in order to create volcanic hazard maps using geological and socio-political map data (i.e., geology maps, geological histories, and contoured topographic maps). Estimate the impact to social and political sectors based on the distribution and style of volcanic activity, given the alert level of the volcano in question. Respond to crises (in a timely manner) in order to mitigate the impact before/during/and after a volcanic disaster. Communicate effectively (orally and written) within your team, to the other teams, and to the public in order to effectively handle any possible volcanic threat. These are assessed by: a.) Press Conferences (Questions and Responses); b.) Effective group discussions; c.) Media Releases; d.) Volcanic Impact Reports; and e.) Effective Inter-agency conversations & meetings. Have an awareness of a.) scientist's and emergency manager's responsibilities, agendas, and expertise; b.) science and emergency management team structures and protocols; c.) external agencies that assist emergency managers; and d.) the public's concerns during a simulated volcanic crisis. The role-play runs best with a low student to staff ratio. We like to invite volcanology and emergency management specialists to the event, to boost student engagement. 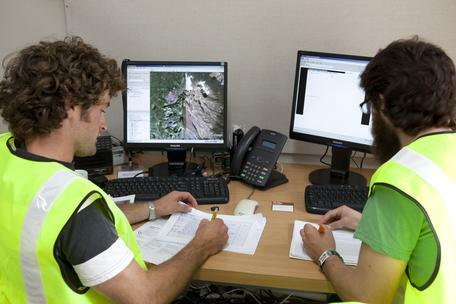 The role-play is best suited to an upper-division (300-level or above) or postgraduate volcanology course, which also includes a significant emergency management component. It runs well with medium-sized classes of 12-40 students, but can be run with smaller courses by omitting specific roles or perspectives (i.e., focussing solely on volcanic monitoring and omitting the emergency management component). It has been run as a workshop-style exercise (4-6 hours running time) embedded within lecture courses and field courses. There are a range of preparation activities included with the role-play which means that it works best as a module which could be run over 2-3 weeks of a typical semester-based course. Equipment required is an open classroom space, with a minimum of 8-10 computers (either as desktops, or student's laptops). It has been run with and without an internet connection. Several important skills and concepts should be mastered by students prior to the simulation. Students should be able to ... 1. Explain and discuss the variety of volcanic hazards associated with different types of volcanism; 2. Read and understand geological and topographical maps; 3. Explain and discuss volcanic monitoring data types and interpretation of these data in case studies and in "real-time"; 4. Explain and discuss how different monitoring data go together to form a working model of what's happening in the volcano; 5. List and describe the New Zealand (or country-specific) Volcanic Alert levels; 6. Describe what geoscience and emergency management professionals do during a volcanic crisis. There is a detailed description within the instructor manual which describes the process of creating your own scenario, specific to your area. This would include building a dataset, and adapting the emergency management protocols suited to your context. As the role-play is quite complex, this would involve a significant time investment; However, we have run this activity in two other countries (Canada and France), and our partners have said it is straightforward process. A detailed instructor manual is attached below. This document describes 1) A detailed curriculum plan including time frames for each step; 2) A description and access to all of the documents and tools needed to run the activity and 3) Teaching tips and special considerations for running the role-play. There are two volcanic scenarios which are built to have students experience either regional or local impacts from volcanic eruptions; Decide which one suits your course goals. If you are running this NZ-based exercise from outside of New Zealand, you can easily familiarize yourself and your students with NZ places, locations, and protocols. This can be a fun way to "travel" somewhere together, that your students haven't been before. The simulation is best used as a "capstone" activity (i.e., allowing students to apply what they've learned in your class). We recommend using this as a social activity and we like to complete the activity with a debrief and a BBQ. The quality of the simulation is dependent on how prepared students are, and how much they relate to their role. Remember to schedule in pre-lab and lecture(s) into your curriculum plan. Assigning students to the right roles can be difficult; it is easier if you know the personalities of the students. Tips: Mix genders and abilities. Decide ahead of time on how much the simulation will be worth (typically 5-15% of a course grade). You may assign some assessment to the pre-readings and other pre-activities to motivate them to prepare. It is really important that you and your staff run through the simulation. Any feedback you receive from your students will help with running it on the following year. Also, please send the authors feedback that you think will improve the Sim. The role-play is assessed using peer- and self-evaluation rubrics of their performance during the activity (typically worth 5-10% of a course grade). Additionally, we like to provide pre-activities which can be assessed such as: media release critiques (to evaluate written communication skills), hazards map presentations (to evaluate decision-making and oral communication skills), and pre-reading summaries (to assess preparedness).